University students in India successfully launched a small suborbital rocket Wednesday, as part of a program that partners students with members of the Indian Space Research Organization to develop and test designs for future rocket payloads. 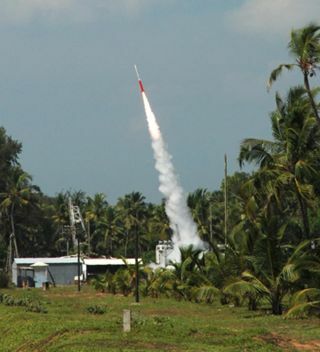 Indiahas successfully launched a small suborbital rocket filled with student-builtexperiments as part of an Indian space agency program to test designs forfuture rocket payloads. Studentsfrom Vellore Institute of Technology University in Vellore, India worked withmembers of the Vikram Sarabhai Space Center of the Indian Space Research Organization (ISRO) to develop part of the payload that wouldlaunch with their RH 200 advanced sounding rocket. Therocket blasted off on Wednesday from India's Thumba Equatorial Rocket LaunchingStation and reached its intended altitude of 37 miles (60 km) in two minutes,ISRO officials said in a statement. Theproject's goal is to provide hands-on experience in the design and fabricationof cutting-edge space technology, while simultaneously working toward therealization of cost-effective future space missions, ISRO officials said. Thestudent-built portion of the RH 200 rocket payload was comprised of tri-axialaccelerometers that monitor accelerations in three directions, a power-switchingmodule that acts as the power control for the payload, and a safe arm relayunit that matched the requirements of the RH 200 rocket. Studentsat the Indian Institute of Space Technology, with support from experts at theVikram Sarabhai Space Center, are also working toward their goal of making thefirst indigenous student rocket. Additionally,as part of its ongoing effort to maintain strong ties with the studentcommunity, ISRO plans to include a miniature satellite ? called a picosatellite? that was designed by undergraduate students across India, in its forthcoming PSLV-C15mission to deliver a remote sensing satellite, called Cartosat-2B, into orbit. Cartosat-2Bis an Earth observation satellite set to launch early Monday (local time) from theSatish Dhawan Space Center inSriharikota, India. Earlierthis year, the ISRO launched a fleet of 11 sounding rockets in two days to study the effects of the partialannular solar eclipse, which dominated the sky above southeastern Asia andCentral Africa on Jan. 15.